Because of my constant shivering before dinner last night, I asked for an extra blanket after dinner. I never needed it. I slept much, much better, and I think my fever is finally broken. I met a Swiss woman named Medly, and she gave me some cough drops. Today was her last day of walking and she wouldn’t need them anymore. She said it was one less thing to carry. Now it’s one more thing for me to carry! I think my pack keeps getting heavier. The cough syrup especially is quite heavy, in thick glass bottles. I will be glad when I won’t need that anymore. Luckily my Macabi skirts have these huge, fabulous pockets, so I can carry a lot of stuff in them. It helps distribute the weight. Medly also asked the gîte lady for me if anyone had left any poles behind that I could have. She went downstairs and came up with one pole. 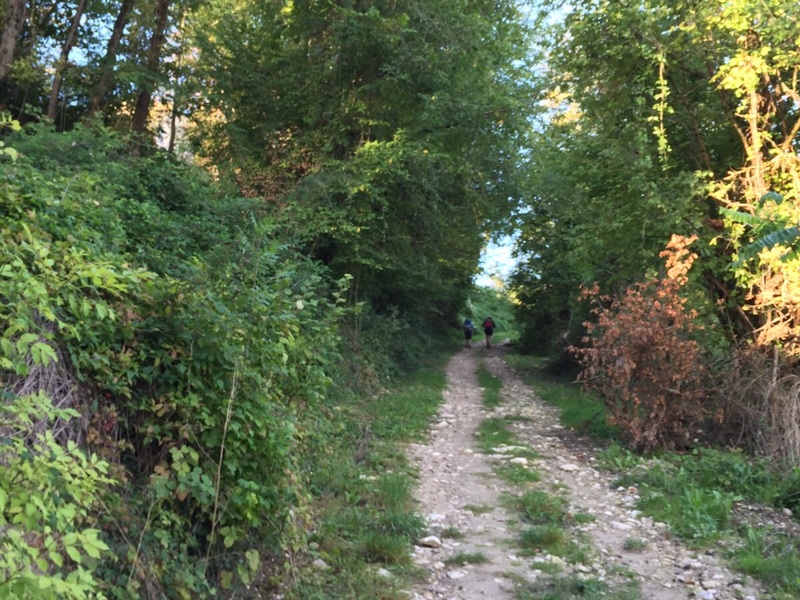 So today, I hiked to Moissac with one pole. I made sure to get some yogurt at breakfast, but I took another immodium. That is definitely not something I want to deal with while hiking. I managed to get out the door right at 8:30. I ran into Linda and Simon, who were leaving at the same time, and Linda said, “oh, I see you’re getting a late start, just like us.” I thought 8:30 was pretty early! I think Spain will be quite an adjustment. I’m already sleeping 9-10 hours a night. To be out by 8, I’ll have to get up at 6:30. The walk through the village was nice. It would have been nicer if I could have explored a bit yesterday, but I just didn’t feel like it. Saturday is another market day, so the market people were all gearing up by the church. Linda made friends with one of the men and he gave her a bunch of grapes for free. Because the city was at a top of a hill, it was down the hill and then up the other side of the valley. We were passed by Tom, and I decided at that point to break away from Linda and Simon as well. It’s always more comfortable when you can walk at your natural pace. I caught up with Tom a bit later, and we actually spent the whole day together walking to Moissac. I think that’s the first time I’ve spent almost the entire day with one person. I think it was good for me, though. Having another person to walk with does make the time go faster and it takes my mind off things, and it definitely helped me go faster than I would have. I am doing much better today, but after my rest day in Moissac I should be even better. After I met up with Tom, I didn’t take nearly as many pictures as I would have. The landscape was still more of this agricultural stuff, but it’s changing as well. Maybe more trees, or different trees. We even saw some trees starting to change colors today. We stopped in a little grocery to buy some food for lunch, and Tanya and Peter were there! I already had a croissant and two bananas and a peach, but I bought some yogurt and some ham. We stopped at a bench so I could eat my yogurt, but I ended up eating everything. I was hungry pretty early today. Tom waited for me, which I wasn’t expecting. We had a lovely day, talking about all kinds of things. He said that driving on the left side is actually more natural than driving on the right. In the old days, everyone used their swords in their right hands, so by going on the left, you were able to protect your woman. So driving on the right side is completely unchivalrous. And Tom was very chivalrous all day, walking between me and the road. I’m definitely behind where I thought I would be. Tom will be in St. Jean Pied de Port on the 10th, so I shouldn’t be too far behind him. I was originally thinking that I would be near Pamplona on the 10th. It’s ok, though, that’s what my buffer is for! It was nice to talk to someone who is so experienced with walking, so he gave me some advice about what to expect in Spain. We stopped at a church about 2 pm for Tom to eat his lunch. I was happy to take a break off my feet. The church itself was closed, and probably not very well cared for, but there was a nice shaded bench and some water. Tom said that it’s a law in France for there to be potable water at graveyards, and there’s usually always a graveyard at the church. After Tom’s lunch break, my hiking pole decided to take a break as well, which is probably why it was left behind in the first place. The two ends came apart, and there was no way of getting them back together, so it went into the nearest dumpster. It did get me almost to Moissac, though. Moissac is quite a large city. Kind of like Figeac, but bigger. It still has a fairly nice feel to it. Walking to the city center, tom stopped in a shop to buy a “kid’s treat” and bought me one as well. One of those fruit popsicles that have absolutely no fruit in them. It was nice, though, after a long, hot day. 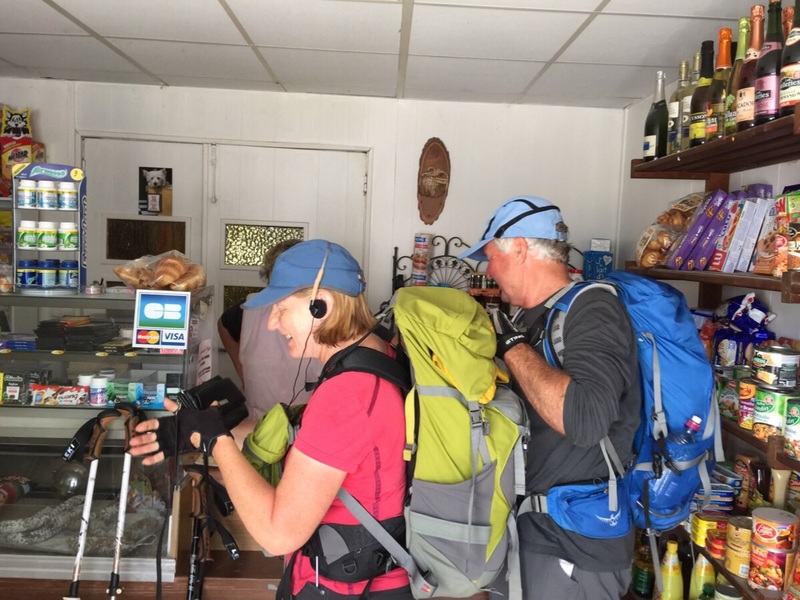 We got to the center of town, and I just happened to see a pilgrim’s shop that sold hiking poles! I got two new poles for 28 E. These ones are silver. Let’s see how long I can keep these ones. I haven’t seen many mosquitoes in France, but the ones in Moissac could classify as small birds. My gîte was up, up the hill behind the office of tourisme. It’s next to a statue of the Virgin that overlooks the city. It’s quite a nice view! According to Miam Miam Dodo, there are 4 churches in Moissac. The gîte owner is Ann, and she is by her own admission a little bit crazy. Her English is very good and she doesn’t have much of an accent. She said she has worked all over the world. She also said she has 8 Americans coming tomorrow! That will be interesting. Dinner was quite nice. There were a few new familiar faces from the gîte the night before. Maybe they will be old faces. 3 of us are going all the way to Santiago. Marcus, Jackee, and me. The starter was some spreads on bread. Fish and salsifiy, and guacamole. The guacamole was delicious. Then there was a bland soup. Then the main was a quinoa salad, regular salad, and something resembling shepherds pie. Dessert was fruit with some cake, and mine was special because it didn’t have any alcohol in it. You have poles again! Whew! You have a way to quickly and easily fasten them on your pack, right? I laughed and said “oh dear” when your pole took a break, but I’m happy you were able to get some new ones. Hope they work well for you. Take care of yourself! I’m still so behind Betsey! But I’m determined to catch up! I enjoy reading all the details and the photos are amazing! When I see your mom she lets me know you’re alright and any recent updates. So glad you’re having s great time! Love you! !